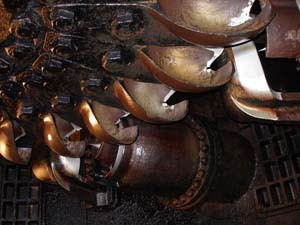 Abrasion on critical hydraulic surfaces, such as this needle nozzle, reduces efficiency and is common on older turbine systems. Even the best turbine systems experience performance degradation over time. Efficiency drops as waterborne silt wears away runner and nozzle surfaces, as bearings and seals age, and when changes are made to the penstock or other components. Canyon Hydro has the experience necessary for a complete inspection of your current turbine system. 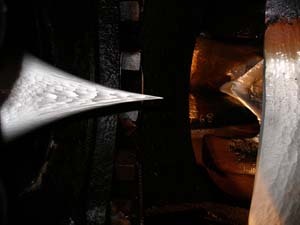 We begin with close examination of the runner and nozzle system, including non-destructive testing (NDT) of your runner using a liquid dye penetrant to detect surface degradation and more serious cracks. The rest of your turbine system is carefully checked for wear and proper operation. Bearings and shaft seals are inspected for wear and leakage. The Hydraulic Power Unit (HPU) is tested, along with all actuators and linkages. Historical operating data are evaluated to spot changes and trends in system output. Similar abrasion from waterborne sediment on the Pelton runner. When the turbine inspection is complete, Canyon Hydro will provide a comprehensive report of your system condition, including photos of key components and hydraulic surfaces. If appropriate, we will include specific recommendations for improving system output. Especially on older systems, turbine refurbishment or a retrofit of select components often results in a substantial increase in production. Canyon Hydro provides complete Replacement and Repair services to optimize your system performance. © Copyright 2014 Canyon Industries, Inc. All rights reserved.